AAPA sent a letter to congressional leadership on the fiscal year 2019 19 USDOT spending bill. AAPA: Dedicate funding from National Infrastructure Investment Program to port projects. Dedicated multimodal infrastructure funding for ports is one of AAPA’s top priorities. To provide adequate resources for three key federal programs that help fund multimodal port-related infrastructure in the United States, the American Association of Port Authorities (AAPA) has sent a letter to the leadership of both the House and Senate Appropriations Committees’ Subcommittee on Transportation, Housing, and Urban Development and Related Agencies (THUD). The letter commends the subcommittees’ leadership on their commitment to fund multimodal port infrastructure, such as the first/last mile connections (roads, rails, bridges, tunnels and waterways) with America’s seaports. It also strongly recommends they adopt the House provision that a third of the funding for the portion of the National Infrastructure Investment Program focusing on multimodal BUILD/TIGER-style projects be dedicated to port infrastructure projects. AAPA is advocating that the fiscal 2019 BUILD (Better Utilizing Investments to Leverage Development) program adopt the Senate funding level of $1 billion, or if possible, the fiscal 2018 level of $1.5 billion. 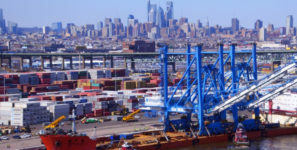 AAPA members have identified $32 billion in needed federal investments in port landside connections and facility infrastructure. For the Marine Highway Program, AAPA strongly supports the $7 million of funding in the Senate bill because the program provides U.S. ports and communities an important option for using ocean and inland waterways to reduce highway congestion. The third program identified as a priority in AAPA’s letter is the Consolidated Rail Infrastructure and Safety Improvements (CRISI) program. AAPA recommends the House funding level of $300 million for CRISI grants because of the port rail access eligibilities the program provides and the opportunities it offers for strong rail and port partnerships. “We thank both the Senate and the House THUD appropriations subcommittees for their leadership on multimodal infrastructure funding issues,” said Nagle. “We look forward to working with them and their Appropriations Committee colleagues on maintaining the 33 percent funding level for ports and setting a funding level of at least $1 billion in the final FY’19 appropriations bill so that ports and their industry partners can adequately address these important infrastructure and supply chain issues,” said Nagle.